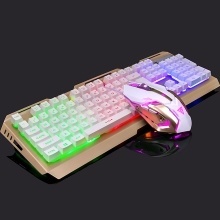 This keyboard and mouse set is specially designed for game, does not affect the game operation, wear-resistant, LED backlight, cool and dazzling at the fingertips. Three-color bright backlit keyboard, seven-color breathing light mouse. The keyboard has 12 sets of multimedia shortcuts. Adjustable keyboard breath light brightness. 4 file adjustable DPI, 1000/1600/2400/4000. 2000 million times micro switch. Built-in 11 kinds of light effect (drive modified). Teflon mat, more practical, rubber anti-skid side skirt, do not slip. Ultra-fast 1 ms response speed.